Here is a female Northern Cardinal (Cardinalis cardinalis), perched on a field stone near the edge of my garden. When I was composing the photo, I was concentrating so much on the cardinal that I did not notice her friend in the background until I uploaded the photo to my computer. If you look carefully at the photo, you will see a House Sparrow (Passer domesticus) behind Ms. Cardinal. Both are regular visitors to our bird feeders. 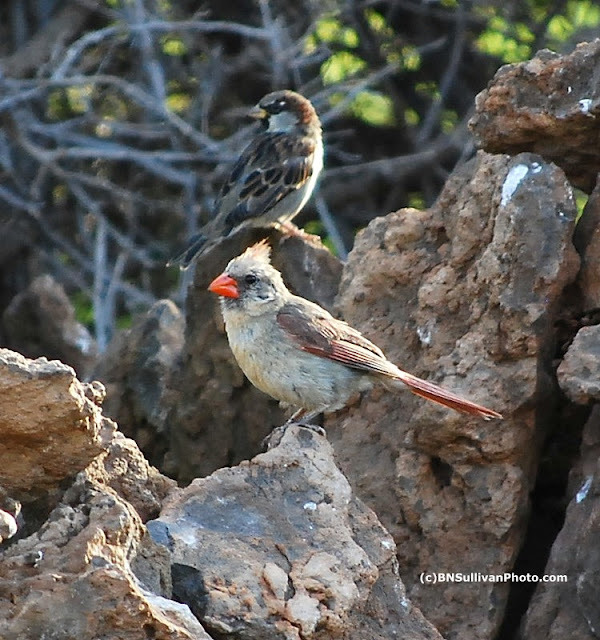 They must love your garden - all those hiding places in the rocks - just perfect for the timid Cardinals. I love Cardinals. We have 3 pair this winter. Yes that sparrow could almost be missed. He blends in rather well. There are several Cardinals that are frequent visitors to the park I visit near Lake Ontario. Lovely photo. Thanks, T and S. As it happened, the composition was almost accidental. I honestly didn't notice the sparrow until afterward.